A particularly malicious program infected Kentuckyearl's computer. He asked the Answer Line forum how to get rid of it. Ineptitude and arrogance cause most PC problems, but vicious software designed to trick you, steal from you, and use your computer to hurt other people do the worst damage. After all, bugs aren't designed to protect themselves, but "viruses" are. What are some of the signs that you may have an infection? * Your home page keeps changing, or web searches keep taking you to the wrong page. 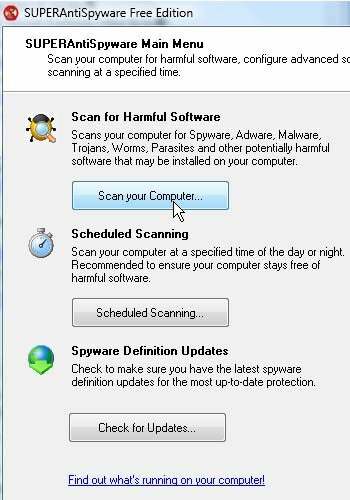 * Software that should protect you, like your anti-virus program, can't update or no longer works properly. * Common programs you can use to configure your system, such as msconfig or System Restore, stop working. * Your computer accesses the Internet a lot when you're not using the Internet. * Your security software tells you that you have an infection, but can't get rid of it. If you think you have an infection, try the following four fixes, in this order. And use them all, even if the second one solves the problem. 1) Accept that your anti-virus program has failed. Don't be too hard on it; you just had the misfortune to get the malware before the update that would have protected you from it. But until everything else is fixed, your current software probably isn't working. 2) Restore the system. Select Start, All Programs, Accessories, System Tools, System Restore. Follow the prompts to restore from a time before you starting having the problem. If you don't have a restore point that old, go on to step 2. If System Restore fails to work, reboot into Safe Mode (reboot, then press F8 before Windows starts loading (it may take a few tries to get the timing right) and try System Restore there. 3) Get a second opinion from another security program. I recommend the free version of either SUPERAntiSpyware or Malwarebytes' Anti-Malware. Download the program, install it, and have it scan your hard drive and eliminate what it finds. 4) Get a third opinion. Repeat with the other of those two programs. If you're not satisfied that you're now clean, download and install another free program: Trend Micro's HijackThis. This one doesn't actually fix anything, but it gives you a very thorough, and for most people, thoroughly unreadable report. But someone who knows what they're doing can study this report and figure out what your problem is and what you can do about it. Click here for a list of online forums where you can upload your report and likely get a helpful answer.